Does it bother anyone else that the muffin on top is on its side? What bothers me most is that I knew that while taking the picture, but I didn’t fix it. I think I was too concerned about trying to manual focus my camera. The auto focus isn’t working right, so it had to go into the shop. I miss it already. Back to the Cheddar Muffins. This recipe is from Country Living Country Mornings Cookbook. Muffins are such a perfect food. So quick, but all that good home-baked taste. Heat the oven to 425 degrees. Grease 12 muffin cups. In a large bowl, with a fork, combine the dry ingredients. Melt the butter and cool it slightly. Stir in the milk, then beat in the egg. Stir the liquid into the dry ingredients just until moistened. Divide the batter into the muffin pans. Oh, I know what I’m baking tomorrow! Looks yummy! Muffins are my favorites. I’m okay when they’re sideways or upside down! My first thought was wondering if these muffins tasted half as good as the ones at Red Lobster…I will definitely find out for myself. It bothers me that the muffin isn’t inside my tummy right now! YUM! Thanks for sharing. I made pumpkin muffins today and they don’t look anywhere near as good. Thanks for visiting my blog today too! Hey, thanks for visiting my blog!Looks like there’s a lot of yummy stuff on yours too! Sounds like we are both homeschoolers and we both like to cook! I love savory muffins, they’re a fun change of pace. I will have to give these a try! mmmmm…Cheddar! mmmmmm…Muffins! These look very tasty and have been added to my breakfast menu for tomorrow. We shall eat some of these delectable looking muffins before we go to church tomorrow morning. YUM! I make a similar biscuit anytime we need a little something else with dinner. They are super fast and so tasty! Thanks for the award. It took me awhile but it is up. I posted your name up under my recipients because I like your site, too. THose would be great with the soup in your last post. Oh these sounds delicious. I’ll be trying these some time soon. Julie, we did have these muffins with the hamburger vegetable soup. I’m going to go put a link on that post. The picture looks good, too. It looks natural. Thanks for stopping by this weekend. Those look really good, and it doesn’t matter that one is turned on its side. You did a nice job focusing your camera! Hey Tiffany, thanks for stopping by to say hi! These muffins sound excellent as do a few of your other recipes. I LOVE my crockpot, so I’ll be back to browse some more! These look delish! I think my son will enjoy helping make these alot! We made aussie garlic cheese n chive damper the other day but we used the muffin tins so we had individual serving sizes for everyone! These are delicious! 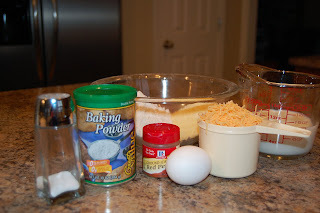 On some of my boards that i belong to my I go by “cheddermuffins” needless to say I LOVE cheddar muffins and this one is a great easy recipe. Thanks! Admittedly I am not much of a baker, but I decided to give these a shot. The flavor was fabulos, but they turned out a little dry. Any tips? Should I had more milk/butter? Courtney, you could add a bit more milk next time if they seem dry. They’re also better when they’re hot out of the oven. If you have them leftover you can warm them in the microwave and that softens them up a bit. I enjoy your recipes, but I must admit that it frustrates me when you don’t give exact measurements. It might be easy for you to add a little bit of this and that but for an inexperienced cook like me, oh! gosh! I can’t tell you. I tried these muffins and too found the to be very dry. Will definitely try adding more milk next time if I try again. Again, thanks for your efforts. These look amazing–I must try them soon! i just made these tonight, they’re awesome! since someone mentioned they found theirs to be dry, i added an additional 1/4 c. of milk and it was perfect. i also subbed in 1/2 c. of white whole wheat flour (and kept the rest 1 c. regular flour) and it was delicious. thanks for a great recipe! oh and by the way, i see why you don’t use cupcake liners, i used paper ones and it was difficult to peel the paper off the muffins. next time i’ll just used the greased pan. 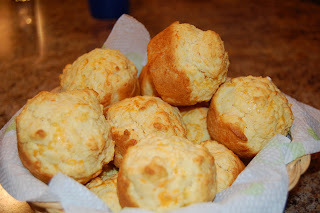 These remind me of the Red Lobster biscuits! Do they have as many calories? Elizabeth, I don’t know what the calorie count is. It seems like it might be less, but I just don’t know. Pepperjack is a fantastic idea! I’ve got to try the pepperjack! That sounds great! We’ve been eating these for a few years with either cheddar or pepperjack, as I commented way back when, but tonight I made them with pepper-cheddar (cheddar cheese with some red pepper flakes tossed in). It was my attempt at balancing my desire for pepperjack with the reality of what I had on hand and it tasted great. 🙂 Thanks again for such a yummy recipe! I love your adaptations! And I always love the concept of using what you’ve got on hand.